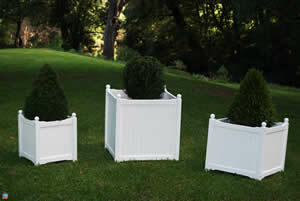 The Planters give a finishing touch to any outdoor setting. The bottom of each planter is slatted to allow water drainage. Handcrafted of American Ash hardwood, using mortise and tenon joinery, with stainless fittings, these planters will weather proudly for years to come. Classic white finish.